If you’re tall guy or gal in need of an extra long twin air mattress, your choices are limited, and the Fox Plush High Rise is probably at the very top. It’s one of the few airbed that comes as an extra long. Luckily it’s also one of the top choices according to its current ratings. We’ve been getting requests from readers to find a few good extra long airbeds, test and compare them, for as long as we can remember. We still don’t have the guide on TOP 3 in the category of extra long air mattresses, but we did the next best thing and reviewed the only extra long mattresses that we believe is worth the money, this Fox. 6 How do we get to the Overall scores above? Now that we have our basic and technical info and our ratings let’s take a few minutes to get into how it secured the ratings, what people shared about and how it tested in our in-house tests. How do we get to the Overall scores above? This is what I call an airbed, and I’m not only talking about it being extra long. I love how high it is, feels like a real bed. I got it for every-day use, and it’s my main bed for 6 months now and I have no complaints so far. This is just too big and the pump doesn’t fully deflate it. For a New York studio apartment it’s a big deal. I got it and now I don’t know where to store it and often end up leaving it inflated so it taken half of my only room. This one rated off the charts in our durability tests. And when we cut the thing we talked about that it might happen because you can actually feel the difference in the thickness of the PVC, it’s 43% thicker which makes this Fox one of the most durable and heavy duty air mattresses out there. But here’s the problem – it’s an air mattress. What we mean by this is that if an air mattress (even one as thick as this) meets and needle or a pin, it will puncture and it will start to leak. It’s just common sense, what the extra thick PVC does it protects it from objects that might pierce a regular air mattress but not this one, like sharp metal edges of furniture or tree branches. In those terms, it truly is one of a kind. As time goes by and companies find new ways to improve on the durability, we are yet to see a company that simply uses thicker material. We can’t be sure about the reason. We know that the material prices are not significant and our best guess is that thicker material means that it’s also less malleable and harder to work with. In other words, the added price in manufacturing might be coming from the nature of the thicker vinyl, rather than the price of the material itself. Bottom line – the consumer ratings based on the data we collected was 9.1/10 (it’s included in the chart of overall ratings above) and our featured testers rate it as an 8.9. 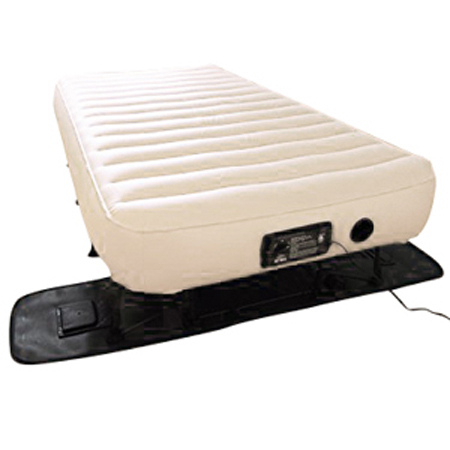 All of the above, combined with our tests (and impressions), and the Final Rating of this twin XL airbed is 8.9. Oh and yes, one more bottom line if you will, if a twin XL is what you are looking for we are sorry to say but you can’t really be picky, this Fox is the best option in twin XL out there. Believe us, we know air mattresses and are not connected to any brand so we have no reason to bend the truth towards one product or another.